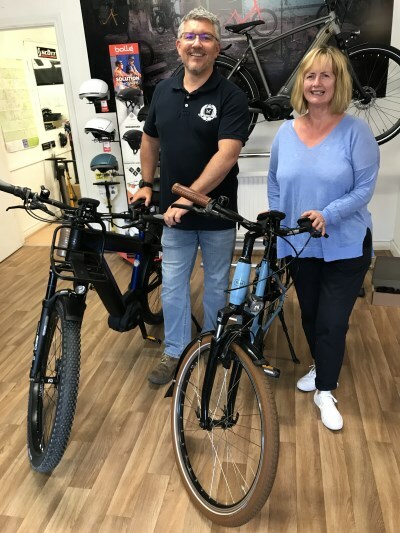 Riese & Müller Steal the Show yet again at OnBike Electric Bikes in Worcester as two lovely customers, Nick and Sara take charge of their trusty steeds! It was a glorious sunny day in Worcester when NIck and Sara entered the store. Like many prospective customers, they’d done some homework prior to visiting and already had a good understanding of ebikes. As we say to most people thinking of investing in these wonderful machines, have a thought first as to where the bikes will be used. Couple that with what purpose they’ll be put to and it’s a great place to start. Now it’s all about the specification, the drive type and of course….the look! Time for some test rides……. Nick was drawn to the Supercharger initially on looks alone. It is without doubt a beautifully crafted ebike and not typical of others. Unique in many ways, the Supercharger offers up a dual battery option. A whopping 1000Wh! With long range in mind and the best gearing in the world thanks to Rohloff, the Supercharger ticks every box for a quality touring ebike. The ladies like style, finesse, comfort and functionality. Sara was spot on when she decided on her Swing Automatic. Set the desired cadence and off you go. No need to think about which gear to be in – the automatic nature of this little gem changes gear for you! The Swing range of ebikes are a real favourite of ours and our customers. Like most bikes from Riese & Müller they come in a multitude of motor, gearing options and colour. They’re an extremely comfortable bike with great ergonomics as well as panache! Riese & Müller have a fantastic website that allows potential customers to spec up their own bike. There’s numerous colours available as well as many options. These can be selected to give an individual spec to suit the customer. This generates a simple code that can be used to order the bike with ourselves. many of our customers bring a printout into our store with the exact size, colour and spec already to hand. 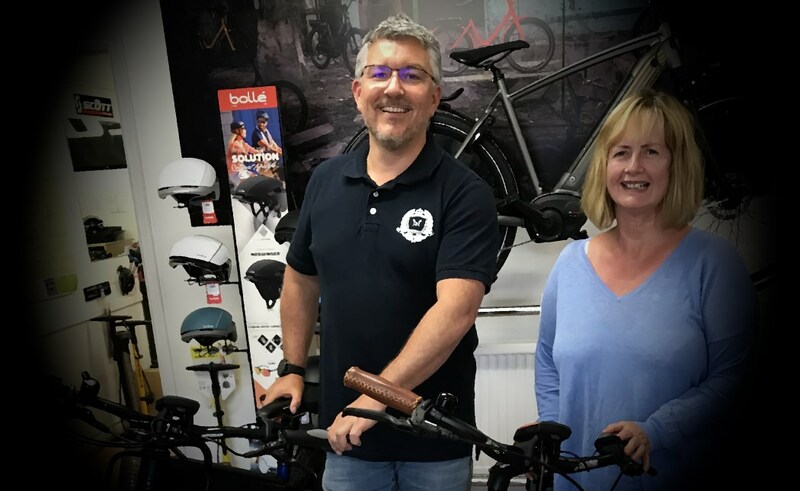 Our thanks to both Nick and Sara for allowing us to immortalise them on our website, for becoming customers of OnBike, and for being such lovely people too!